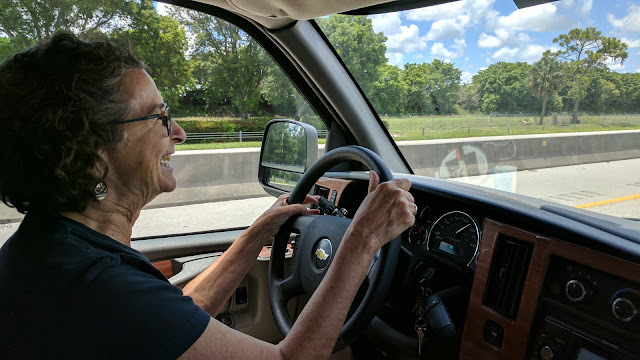 In between Indianapolis and Syracuse, we decided to take the northern route through Canada, which would allow us to visit the Roadtrek factory in Kitchener. Not only did we visit and get a tour, but we stuck around a few days and they also were able to fix a few issues. 1. the electric sofa that wouldn't move 2. a missing rear bumper and 3. the battery drawer that would fall out if you opened it. All this with no charge. Now that's customer service! The rally was over on Saturday night. We had really good Verizon Internet where we were parked, so we decided to stay thru Sunday afternoon and do our live streaming "What Does This Button Do?" show from the Roadtrek in the parking lot! It went well, you can watch it here: Beginners Questions on Smartphones. Here's what it looks like to have a broadcast studio inside a Roadtrek van! After Indianapolis, we had nothing on our work calendar until the NE Area Rally in Syracuse, NY the first week of August. That means we had two and a half weeks to travel less than 800 miles. Oh boy, what should we do. Looking at the map, we decided this would be a great opportunity to cross the border to Canada for a little while. For the first couple of days after the big rally, there was a little rally that we attended with other Full-Timers and Elks Lodge chapter members. It was a relaxing fun time. Jim did some woodworking? Then we headed north. We just felt so footloose and fancy free. 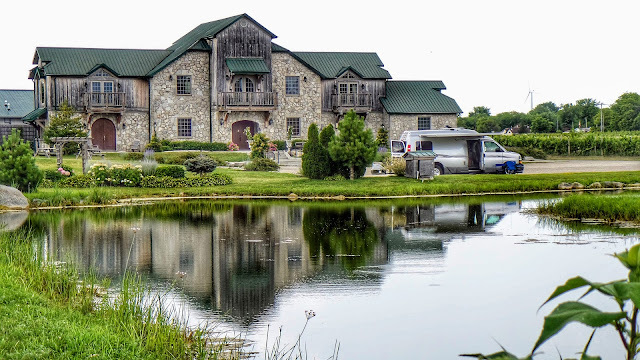 We found a place to stay overnight by checking our HarvestHosts.com membership and discovered a winery just on the Canadian side of the border. It was so picturesque, we made it our headline photo for this blog. The wine wasn't bad either. Sprucewood Shores Winery. 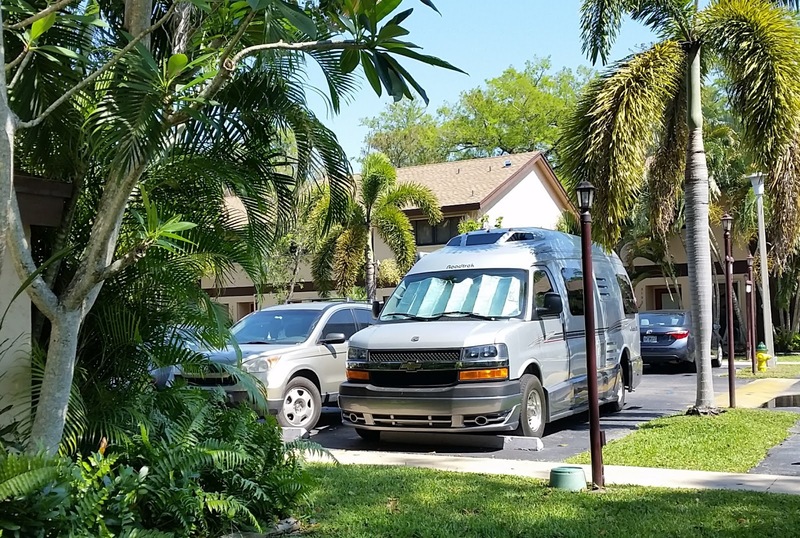 The only thing that is a drawback about traveling in our new, little Roadtrek RV is that we don't have a towed car with us. It's not that difficult to stow the contents, unplug the electric and drive away, but you gotta really want to. It needs to be important. When we're parked at a rally we like to stay put unless it's something really important. I don't know if it looks like it, but doing that live show is quite a bit of work and it's stressful. Therefore, we always reward ourselves after a show is done (whether it went well or not!) by celebrating with a glass of champagne. We had none. No champagne. No wine. No beer. Nothing to celebrate, reward, or relax with. And, everyone else was gone, we couldn't go begging. Well, it was time to hit the road anyway, and we needed to do grocery shopping. We went to Walmart. We've been to enough Walmarts to know that some stock beer and wine, and some don't. We were taking our chances. It's probably state laws, we don't delve into it that much. In this Walmart, we were quite excited to see that they not only had wine but also liquor. We stocked up! Our next destination was a small rally with RVers who belonged to the Fulltimers group, or the Elks. We are part of this group, we would not be working during this rally, just partying! I even picked up supplies for my favorite partying cocktail, Seagram's 7 and ginger ale. Satisfied with our full grocery cart, we made our way to the checkout. The clerk took a look at our haul and informed us, "Sorry we can't sell you alcohol on Sunday." It's cool how our life has evolved. We've been presenting seminars at every FMCA national convention since 2005. They do 2/year, so that's 24 rallies so far. They're usually one in the east and one in the west. Between the FMCA and the Escapees "Escapade" rally - that's what sets our primary travel itinerary each year. Then, in between rallies we play - or go home to Florida. We also fill in with other rallies, RV parks, senior centers, computer clubs, and even people's homes. Wherever people gather who like to learn about technology - you may find us there. 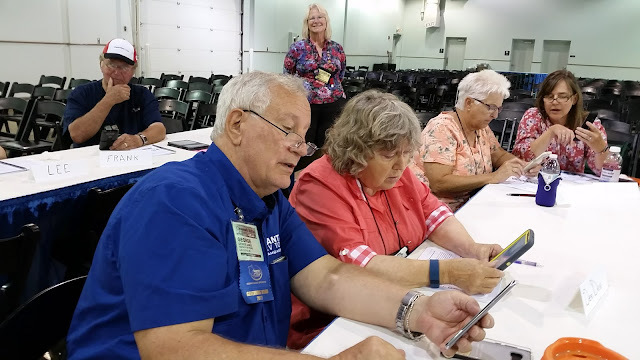 This time, the destination was Indianapolis for the FMCA convention. First stop - a friend's driveway in Gainesville area. We try to stay and visit Alex any time we're passing by. Now, with this little RV, its so easy! Alex likes to travel by RV also and she has a little Casita trailer. We think she would like the Roadtrek as well, so it was fun to get to show it to her. I wouldn't be surprised to see her get one sometime soon. And, we lucked out while we were there, another friend, Mark Miale, was playing music at nearby One Love Cafe. If you ever get the chance, go hear him, he's really good. Here's his website: MarkMiale.com with lots of samples of his music. Ok, now we're ready to get off to work! No other stops along the way so we're just in travel gotta-get-there mode. When this is the case we often stay at Walmarts and Cracker Barrels. 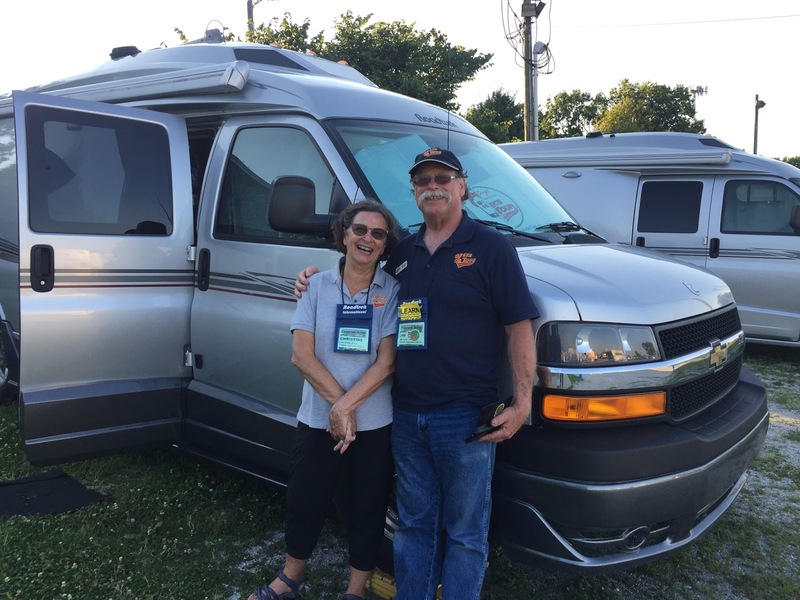 We find them by using our trusty All Stays Camp and RV app. It doesn't matter when we get there, no reservations required and there's everything we need in the way of food and supplies. At Cracker Barrel we get dinner AND breakfast! We didn't even need to use the special RV parking spots! We fit into any parking spot - and this one was more level. Another place we can stay for no extra charge is Thousand Trails RV parks. We pay an annual membership fee, and then can stay for up to two weeks each at about 50 different parks around the country. One of these was on our way and not too far from Indianapolis. We can also use our Allstays App to find these. See this highlight from our What Does This Button Do show that demonstrates how to do that. Finding Thousand Trails Parks with Allstays. We always like staying at Thousand Trails. Even pulling into the FMCA rally was simpler with the Roadtrek. Parking us is always a bit of a problem because they have specific areas for Vendors, and for Attendees. But we're not vendors and we're not just an attendee. We are in a class almost by ourselves as Seminar Presenters. A few others are in this category - Wayne and Dahelia Hunt who teach the fitness classes, Al Hesselbart who teaches RV History, Roger Marble who teaches about Tires and Genealogy (that goes together like fish and bicycles?!) These are people that we see twice each year at FMCA because we're usually parked together. But, since there are so few of us, the parking crew is usually clueless as to where to put us. Now, when we drive in with a Roadtrek - they point "over there are all the Roadtreks!" Hey, that's fine with us. Roadtreks usually get electric hookups, are near the bath houses, and are near the activities because its understood that people traveling in these little motorhomes don't have cars to get around and generally like to have the shower facilities nearby as well. One of the first people we ran into was Mike Wendland and his wife Jennifer. They run the website Roadtreking.com and he wanted to interview us about our transition to the small motorhome lifestyle. Then it was time to get to work. We had to go to an Office Depot to get a bunch of stuff printed (using the remarkable FMCA Office Depot discount) Then it's Jim's job to package the printouts with our USB drives of all our teaching content - videos and .pdf files - that we include with our special membership offer during the rally. And it's my job to review all our seminars and be sure we're ready for our presentations. Then it's a blur for 4 days of the rally. This is the hands-on class on smartphone photography. People learn by doing. Here's a sweet little slide-show / movie that Facebook put together of these days. After only ten days at home, we had to hit the road in order to get to Indianapolis and the FMCA summer convention. It was so much fun to be packing the little boy camper. We could park it right in front of the townhouse and carry items back and forth. Is there a space for this? Yeah, it fits perfect. But not this ... can I do without it? Do I really need a second pair of shoes? For the whole month in Europe, I only wore the Teva sandals, I think I can manage the same here - we plan to be gone 6-7 weeks. Jim rigged up a special place to store shoes - canvas pockets attached to a tiny wall space. It only holds two pairs of shoes, one for him and one for me. We had to stake out our claims for storage space in the bedroom area. There's only one closet, but neither Jim or I have any clothes we care to hang, so Jim got out some tools and removed the hanging apparatus. I put dibs on the closet itself and said I needed shelves. Our only clothes are shorts, jeans, and shirts. Shelves are good. Once again, the month in Europe was instructive. All the clothes I had packed into little net packing cubes. Might I want to continue with that system? I think I'll try it. Clean clothes get packed in the cubes. As I pull items out to wear, they go on the bottom shelf until laundry day. There is no place for a laundry hamper. We were very happy to find that everything in our house refrigerator fit in the camper fridge. It's just a little smaller than what we had in the big RV. And all the pots, pans, dishes, and silverware were already in place having been simply transferred from Big Boy to Little Boy. All these basics of living, we have a set for the RV and a set for the house, no re-packing necessary. We could take our time and let everything settle into place. So much nicer than when we had to store the big rig on a lot several miles away, pack the car with everything we needed, and go. This is really different from full timing though. You're never sure that you have everything. Chris- do you have everything you need from home? Computer, tablet, 2 types of phones, our propeller hats, show and tell items? Jim, did you get the projector? Our projection screen is one thing we have to do without. Any place we present will need to have a screen. When we were fulltime, we knew we had everything with us, because there was no other "home." The RV was it. We had everything we owned with us. Once we had made our list and checked it twice, we were off! The weirdest part was leaving the car at home. We could tow a car with this van, but that kind of defeats the purpose of having such a small, mobile unit. We loved the idea of being able to park anywhere, turn around, back up, all those things you can't do with a big rig towing a car. I insisted on driving the first day just because I can! It is so much quieter, so much lighter, so much easier on the nervous system than the big rig. In 6 years with Big Boy, I doubt that I drove more than 10 times, and then not more than 2 hours till I was tired. I drove Little Boy about 3 hours on the first day and felt no worse for wear. We had no reservations for a place to stay the first night, but we had no worries that we could find someplace. We made it further up the coast than we expected, so we checked our favorite on-the-beach campground, Gamble Rodgers State Park and were told they had one oceanfront site available but it could not be reserved, it's first-come / first-served. By the time we got there, it had been taken. Oh well. We kept going and pulled in to the parking lot for our favorite Florida winery Flagler Beachfront. 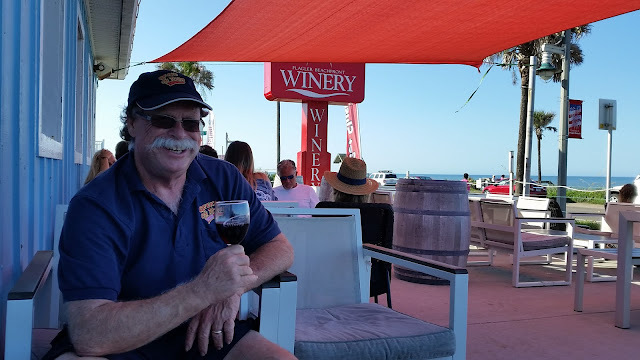 We had been here last July and fell in love with both the wine, and the bread and cheese platter. It didn't disappoint this time around either. But, it was still light out and we had over 2 hours of daylight left ... let's keep going. We were generally headed to Green Cove Springs because that's where our "domicile" is and our mail. We had something that needed to be picked up at St. Brendan's Isle. We ended up staying the night at the Elk's Lodge in Green Cove Springs. It's right on the St. John's river. What a picturesque place! And what a perfect first night in our tiny self-contained home. Blessed be the flexible, for they shall not be bent out of shape.